One of the most important tasks on a DBA’s to-do list is backing up databases on a regular basis. This is because reliable backups are the most important tool in ensuring data recovery. Therefore, it is important for the DBA to check for database backups and validate that they have been successfully created and saved in a secure location. 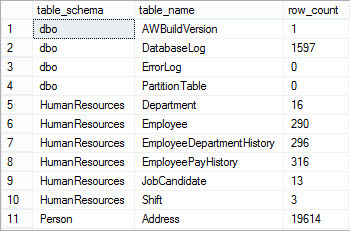 database_name – Specifies the name of the database. recovery_model_desc – Specifies the recovery model of the database. last_full_backup – Specifies the date time of the latest full backup. last_diff_backup – Specifies the date time of the latest differential backup. last_tran_backup – Specifies the date time of the latest transactional log backup. days_since_full_backup – Number of days since the last successful full backup. days_since_diff_backup – Number of days since the last successful differential backup. full_backup_location – Specifies the physical name of the full backup file. diff_backup_location – Specifies the physical name of the differential backup file. tlog_backup_location – Specifies the physical name of the transactional backup file. I have created a SSIS package that runs this script on a daily basis on each of my Production SQL Servers and then copy that information into our CMS database. This approach helps me to quickly identify the databases where backup is not successful. Please share your approach, which you use to accomplish this task. It will be interesting to know that. 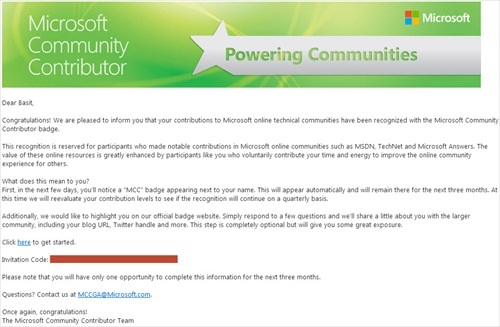 Today, I’ve received an email from Microsoft stating that I’ve been awarded Microsoft Community Contributor. This is the first time I’ve been given this special award, and it feels so good to be recognised for my SQL Server community work. I’m not sure how to go about getting nominated for this award, but it seems I’m doing something right. I’d like to thank whoever nominated me for this award and Microsoft for recognizing my SQL Server community work.